Normally I don't do much home cooking on a Saturday, however with this being Ramadan things are different. My husband and I decided to not eat out for the month of Ramadan (not including Masjid and friends' Iftars). So my usual Saturday evening dinner out after a day of running around the city with my two favorite people (Hubs and little M) is on hiatus for now. All this to say YEAH more content for my blog and for you! As you may already realize i love anything curried or with Channa (chick peas). 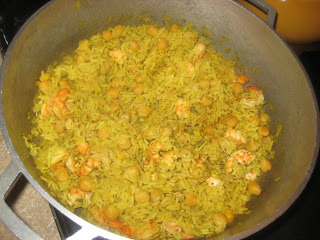 Some time ago i started making Curried Channa rice, and i absolutely loved the recipe. 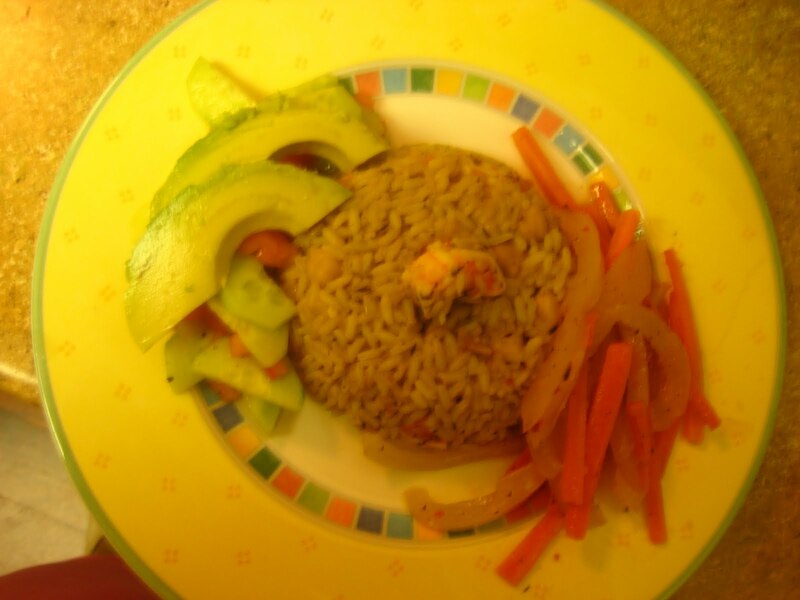 On this particular occasion, i decided to kick it up a notch.... so i added Shrimp, and let me tell you it was YUMMERIFIC!! Give this recipe a try with or without the Shrimp or maybe chicken. It may become one of your favorites as it has surely become one of mine!! In a dutch oven or cast iron pot, coat the bottom with Olive Oil. Add the butter, garlic, ginger, thyme, red pepper flakes, and 1tbsp of curry powder. Turn the burner on medium high. When the garlic starts to “dance” (sizzle around the edges) add the chopped onions and rice to the pot. Allow the rice to toast in the pot for 1min (stirring constantly to prevent sticking). Add the stock/water to the pot first then remaining ingredients (channa, green seasoning, pepper sauce, chicken bouillon, curry powder and cumin). Turn the heat down to medium-low, then the stock/water start to simmer, taste the water to make sure there is enough flavor (adjust if necessary). Set time for 20 minutes and cover the pot. 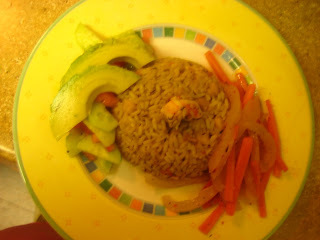 When the timer has 8 minutes left, add the marinated shrimp and stir in completely. When the time goes off, turn off the heat and keep pot covered for the steam to finish cooking the rice.